Nachos are everywhere, you just have to look for them. 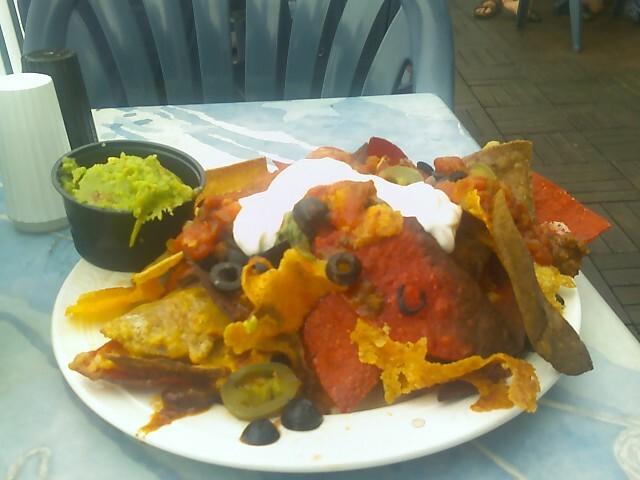 While on a daycation on Nantasket Beach in Hull, MA (motto: come for the placid water, leave because of the biting flies), a lone reviewer went for a beer in the out-of-doors and came away stuffed to the gills with nachos. For nacho patrolling is more than a job, it’s a lifestyle; and you can never get away from that. The Red Parrot is a multi-level bar/restaurant right on the beach with a lovely, if plastic-laden (chairs, tables, utensils, cups, etc.) roof deck that overlooks the ocean. Don’t let the Corona umbrellas fool you– they actually have a semi-decent, if small, draft list. On this particular Wednesday afternoon, the crowd consisted of about 50% bikers, the rest made up of townie barflies, tourists, and the odd South Shore bro. They all shared one thing in common though: an affinity for seriously questionable body art. The highlight had to be a 10-inch tall, full-color, detailed representation of none other than everyone’s old friend, Captain Morgan. Classy. But yarr, enough chit chat, there be nachos to be had! Appearance: (6) Haphazard, colorful, with a large vat of guacamole on the side. On closer inspection,however, it became clear that much of the range of color was due to various shades of char. Quality of Ingredients: (4) God, I hope that the cook got distracted or something and that that they don’t normally leave nachos in the broiler this long, because these were burnt to a crisp! It was worse than anything we had ever seen before. The red chips were turned dark brown, the white were turned purple…it was a crime against nature. Some of the cheese was so crisp that it was mistaken for chips! The salsa was standard and the chili was pretty generic. The guacamole, to which all the hopes for these nachos were soon pinned, upon further examination turned out to be woefully stringy. Distribution of Toppings: (4) When the cheese is crisp enough to masquerade as a chip, then it isn’t serving it’s purpose within the nachos. There was also not nearly enough chili to make up for the lack of moisture. The salsa on top invaded everything, unfortunately. And the chips themselves were abnormally large, making proper distribution (not to mention consumption!) a bit too difficult. ← Blah, Blah, Blah Cafe: What’s in a Name?